Budgets are more than just paying your bills on time—a budget is also about determining how much you should be spending, and on what. The 50/20/30 rule, also called the 50/30/20 budget, is a proportional guideline that can help you keep your spending in alignment with your savings goals. Adults—especially young adults just starting out in life—can benefit greatly by following the simple principles set forth by this budgeting system. When you know how to achieve a balanced budget, you can take the next steps to further customize this rule around your own unique expenses and goals. The 50/20/30 rule can help twentysomethings start sorting out the complicated world of personal finance. Make an effort to get into this habit, and budgeting will be a far simpler task throughout your life. Sure, you can make adjustments with a tweak here and a nudge there, but by staying close to the core concept of this budgeting system, you’re guaranteed to gain financial ground, rather than lose it. To begin abiding by this rule, set aside no more than half of your income for the absolute necessities in your life. This might seem like a high percentage (and, at 50 percent, it is), but once you consider everything that falls into this category it begins to make a bit more sense. To be clear, your essential expenses are those you would almost certainly have to pay, regardless of where you lived, where you worked, or what your future plans happen to include. In general, these expenses are nearly the same for everyone and include housing, food, transportation costs and utility bills. The percentage lets you adjust, while still maintaining a sound, balanced budget. And remember, it’s more about the total sum than individual costs. For instance, some people live in high-rent areas, yet can walk to work, while others enjoy much lower housing costs, but transportation is far more expensive. Think of this as your “get ahead” category. Whereas 50 percent (or less) of your income is the goal for essentials, 20 percent—or more—should be your goal as far as obligations are concerned. You’ll pay off debt quicker, and make more significant strides toward a frustration-free future by devoting as much of your income as you can to this category. The term “retirement” might not carry a sense of urgency when you’re only 24 years old, but it certainly will become more pressing in decades to come. Just keep in mind the advantage of starting early is you will earn compounding interest the longer you let this fund grow. The last category, and the one that can make the most difference in your budget, is unnecessary expenses that enhance your lifestyle. Some financial experts consider this category completely discretionary, but in modern society, many of these so-called luxuries have taken on more of a mandatory status. It all depends on what you want out of life, and what you’re willing to sacrifice. The reason that this category accounts for a larger percentage than your savings is because so many things falls into it. These personal lifestyle expenses include items such as your cell phone plan, cable bill and trips to the coffee shop. If you travel extensively or work on-the-go, your cell phone plan is probably more of a necessity than a luxury. However, you have some wiggle room since you can decide upon the tier of the service you’re paying for. Other components of this category include gym memberships, weekend trips and dining out with your friends. Only you can decide which of your expenses can be designated as “personal,” and which ones are truly obligatory. Similar to how no more than 50 percent of your income should go toward essential expenses, 30 percent is the maximum amount you should spend on personal choices. The fewer costs you have in this category, the more progress you’ll make paying down debt and securing your future. Establishing good habits will last a lifetime. You don’t need a high income to follow the tenets of the 50/20/30 rule; anyone can do it. Since this is a percentage-based system, the same proportions apply whether you’re earning an entry-level salary and living in a studio apartment, or if you’re years into your career and about to buy your first home. A note of caution, though: Try not to take this rule too literally. The proportions are sound, but your life is unlike anyone else’s. What this plan does is provide a framework for you to work within. Once you review your income and expenses, and determine what’s essential and what’s not, only then you can create a budget that helps you make the most of your money. Years from now, you can still fall back on the same guidelines to help your budget evolve as your life does. 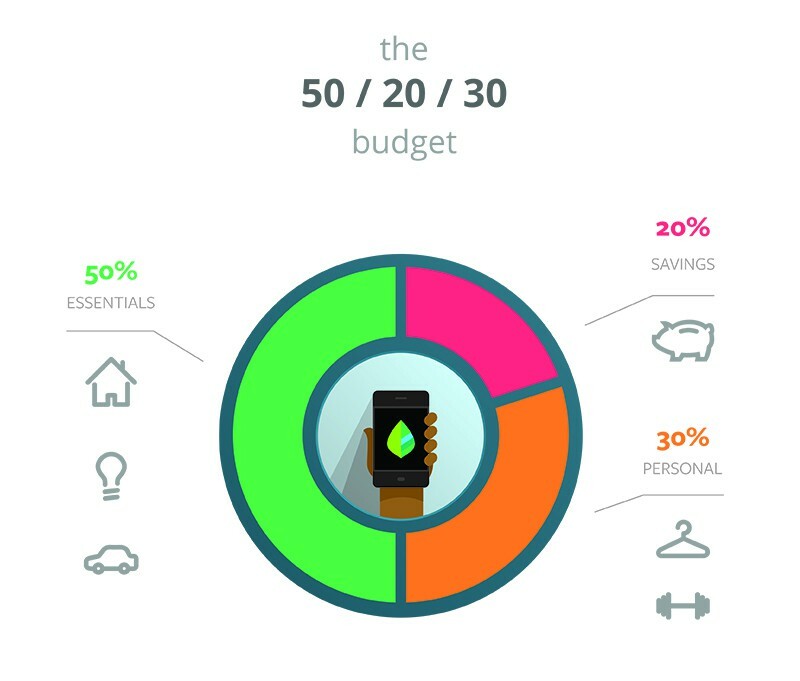 Mint offers budgeting software that makes it easy to live in accordance with the 50/20/30 rule and help you live life to its fullest. After spending just a little bit of time determining which of your expenses fall into which category, you can create your very first budget and keep track of it every day. And when your situation undoubtedly changes, Mint lets you adjust so your budget can change with you. Sign up for your free account today, and make this the year you build a strong foundation for your future.